Inflorescence of racemes scattered along a central axis. Spikelets 2–4-flowered with reduced terminal floret, shortly pedicelled, slightly laterally compressed, disarticulating above the glumes but not between the florets; glumes persistent, subequal, 1-nerved, acuminate; lemmas 3-nerved, dorsally lightly keeled, hairy on the lateral nerves, obtuse or emarginate at the apex, shortly awned from the back. Perennial. Rhizomes short. Culms erect; 40-90 cm long. Ligule an eciliate membrane. Inflorescence composed of racemes. Racemes borne along a central axis; unilateral. Rhachis subterete. Spikelet packing broadside to rhachis; lax. Spikelets solitary. Fertile spikelets pedicelled. Pedicels linear. Spikelets comprising 2-4 fertile florets; with diminished florets at the apex. Spikelets oblong; laterally compressed; 5.5-9 mm long; breaking up at maturity; disarticulating above glumes but not between florets. Floret callus evident; pilose. Glumes persistent; shorter than spikelet. Lower glume lanceolate; 0.9-1 length of upper glume; 1-keeled; 1 -veined. Lower glume lateral veins absent. Lower glume apex acuminate. 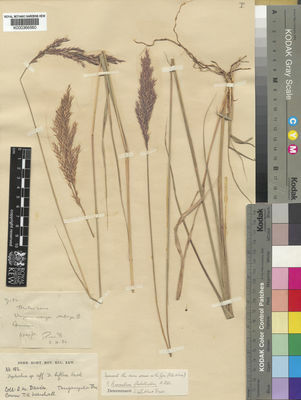 Upper glume lanceolate; 1-1.2 length of adjacent fertile lemma; 1-keeled; 1 -veined. Upper glume apex acuminate. Fertile lemma elliptic; membranous; keeled; 3 -veined. Lemma midvein pubescent. Lemma margins pubescent. Lemma apex emarginate, or obtuse; awned; 1 -awned. Principal lemma awn dorsal. Palea 1 length of lemma; 2 -veined. Palea surface pubescent. Apical sterile florets resembling fertile though underdeveloped. Caryopsis with adherent pericarp; linear, or oblong; isodiametric; biconvex. in S. Afr. J. Sci. 37: 183 (1941). in S. African J. Sci. 37: 183 (1941).